I hope will already in the beginning of the Autumn will settle a program for our Film Evenings. Those who are particulary interested in film, tell me and we´ll take an evening to make the program. 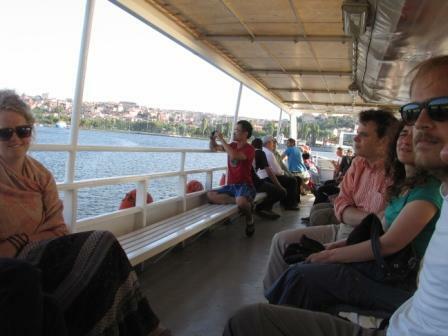 In June we went 14 persons to Istanbul. A travel with many subjects, but basically about: Us as Christians from Western Europe, meeting with other people, different from us in traditions, religion, history. We prepared the trip since September last year (9 month also for this baby to be born…) with conferences on Byzantine life, Turkish mosques, Alevi (islamic religious minority) prayers, with dinners and films, seminares on texts we reada and prepared for each others: byzantine and ottoman history, turkish culture, religous life and social and poitical situation. Then we came there. Hosted by the Dominicans who also helped as with talks and discussions, and with preparing our program. One part of the day visiting the city, mosques, churches, run down areas, rich areas – the other meeting with people: people working with caritative work, with Zeynep, a moslem woman telling her story, with a lawyer working with minority rights, brother Alberto who talked about the sufi islam, the metropolite of Bursa and also with the ecumenical patriarch, the most prominant person of the Orthodox world, br Claudio who helped us to reflect on our experiences from this stay. 10 days together with sharing, seminares and meals, outgoing and prayers – so many good things. 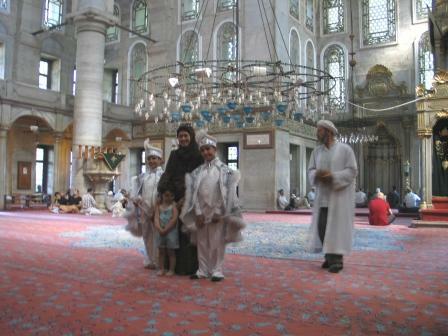 The strongest impression I brought back from Istanbul last year was of a city strangled by traffic. A huge megalopolis suffering from an unbearable traffic that makes life quality miserable. Of course also of a city full of history and great monuments where one can enjoy good food and relatively warm welcome. But last year focus was on the euro-asia marathon within general touristic setup. So I was really looking forward to come back with a different preparation and get a new perspective on this important city. Although at times quite demanding the monthly preparation we have done during last year was important to come to this trip knowing history, culture, politics, religions, aspiration of Istanbul and his citizenship. Traveling in a moderately large group is an experience in itself. Although very different in age, nationality, background, interest out group was quite harmonious and our staying together pleasant. Traveling is a great way to check how people interact, accept suggestions, offers support, take initiative. And sharing such an experience is a great way to grow. But the best part of the trip, the real delta compared to any other more touristic trips, has been meeting a lot of different people living there. It has been very interesting to talk to all the subjects living there for different reasons: local and foreigners, to study, research, help out. To look and listen to a new reality through their eyes and ears and learn about social justice and religious relationship. So the strongest impression I brought back this year from Istanbul is of a city that has a very rich human capital and that struggles with his problems, problem of fast growth, traffic, housing, commuting, relation with minorities and poverty with great dignity and perseverance. 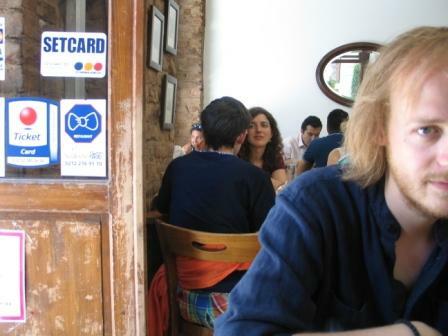 Ten days in Istanbul gave us the time to consider and encounter the city in slow motion – slow, that is, if one compares with the hectic marathon running performed by the tourist who wishes to get a good impression of the city in just a couple of days. Spending an entire morning in Hagia Sophia allowed us to familiarize with the room, peek into hidden spaces, attempt to read inscriptions almost erased by the gentle but diligent caresses of time. The same ten days let us explore the city walls and climb the steep stairs up to one of its towers and see the city from above. In these days brother Björn led us in to the peaceful atmosphere of a mosque that had formerly been a church, before it was a different church – before it (perhaps) was a temple. The sense of a peaceful continuity may of course be – and is – somehow deceiving, yet it is not entirely unfounded. In some way a city like Istanbul, despite its kemalism, shows all these ancient and modern prayers and rituals to coincide. In the Blachernae church we met a Greek that showed us Gunnar Ekelöf’s overkissed Madonna in a modern church over an ancient sacred spring under a modern, yet pre-Christian inscription. And the continuity applies not only to sacred rooms; the water of the Turkish bath we bathed in, is the same as the one enjoyed by Byzantine Romans and Ottomans – and the massage, I imagine, is not entirely different. Surely ten days is nothing compared to the history of the old Byzantion that became the New Rome, the Constantinople that became Istanbul, but with enough time on our hands to wander the streets instead of taking the metro we were able to pass through these different neighborhoods of history. We met people who inhabited these neighborhoods, and we learned that at this peninsula where the waters meet, small sardines are not used as bait for the big catch, but are themselves what people on the bridge are looking for. One of the last days in Istanbul we had a conversation about age and how some of us could be parents to others and so on. Indeed, the age difference between the youngest and oldest of us was over 20 years! 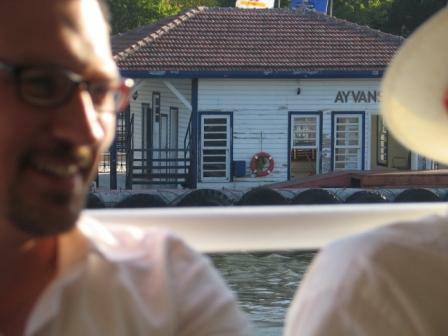 The more I now think about it, the more amazed and happy am I to have been part of such a heterogenic and interesting group of Istanbul-visitors. We were 14 people of very different age, coming from different countries, studying or working in different fields and belonging to different Churches. I can only think of three things we had in common: we all spoke English, we were all Christians and we were all taking part in the same trip to Turkey. Our different backgrounds and points of view were a great source of inspiration to me. In every discussion there were comments on things I would never have thought of myself and everybody shared their specific knowledge and thoughts. It was a huge resource to be around people with so many different areas of expertise. Most brilliant of all, we had so much fun together! One of the most important things I bring with me from this trip is a new view on ecumenism. I never gave much thought to it until now, when I prayed and shared every-day life with Christians other than Catholics. The special parts of our program, connected to the Orthodox Church in particular, as well as all the conversations in the group, awaked my interest for the history of Christianity and its different Churches. I am very happy for the opportunity of this exchange and I am positive that our trip made me more interested and open-minded towards other Christian communities.